When I visited the 1066 Cake Stand (review here! ), I was intrigued to see this brand of chocolate bar, especially the white chocolate, as I haven’t yet found a vegan white chocolate I really love. Vivani Chocolate is organic, with its cocoa from cooperatives in Ecuador & the Dominican Republic & it doesn’t have emulsifer soy lecithin in it. They also have lots of gluten free options – although like the milk issue, they do have to state traces may be present. The four bars I am reviewing appear to be gluten free as only listed as a “may contain” – check out more info here. You can buy Vivani online in a few places, including the Vegan Tuck Box who had their bars sell out at Veg Fest London this year. After buying my first white bar from the 1066 cake stand I decided to ask if they would post me a bunch via mail order, so being the nice peeps that they are I had all four flavours of their small bars, which usually retail at 99p each. Here’s a description of each – in order of preference. Black Cherry: The darkest bar of the bunch, with an unusual but pleasantly short ingredients list (just cocoa mass, raw cane sugar, cocoa butter & sour cherry pieces). This had a nice strong dark chocolate flavour interspersed with little fragments of fruity cherry. 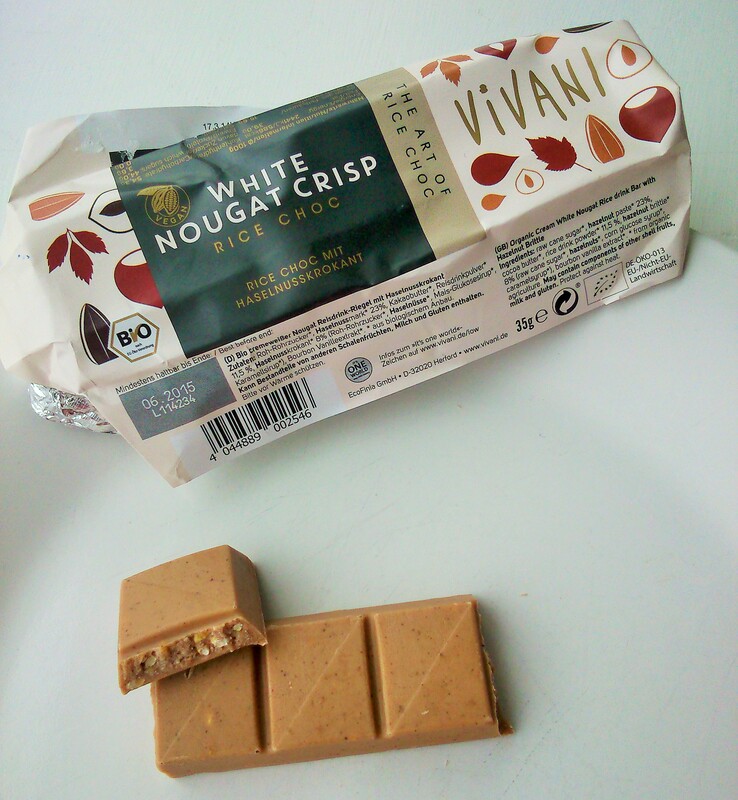 Although I’ve ranked it 4th, it was still tasty enough, I just preferred Vivani’s creamier bars. Mandel Orange (Almond and Orange): This bar uses rice milk to make it more milky than the Black Cherry bar. The mix of the strong orange flavour from granulated orange & orange oil with the chopped almond & dab of hazelnut paste makes for a delicious combination. Dark Nougat: This is a creamy, melt in the mouth bar. A sweet morish chocolate, with hazelnut paste and crunchy hazelnut brittle and hazelnut pieces. I would definitely repurchase this one. White Nougat Crisp: I love this one! It’s not white – as you can see from the extra photos I took, more of a creamy beige colour, very reminiscent of the hazelnut cream you’d find in a kinder bueno – if you’ve ever eaten one! This bar is gorgeous, sweet, nutty, some crunch from the hazelnut brittle & a little vanilla flavour too. I’ve not found a bar like it, and have tried to buy more but they are popular – so try to grab one when you see it! 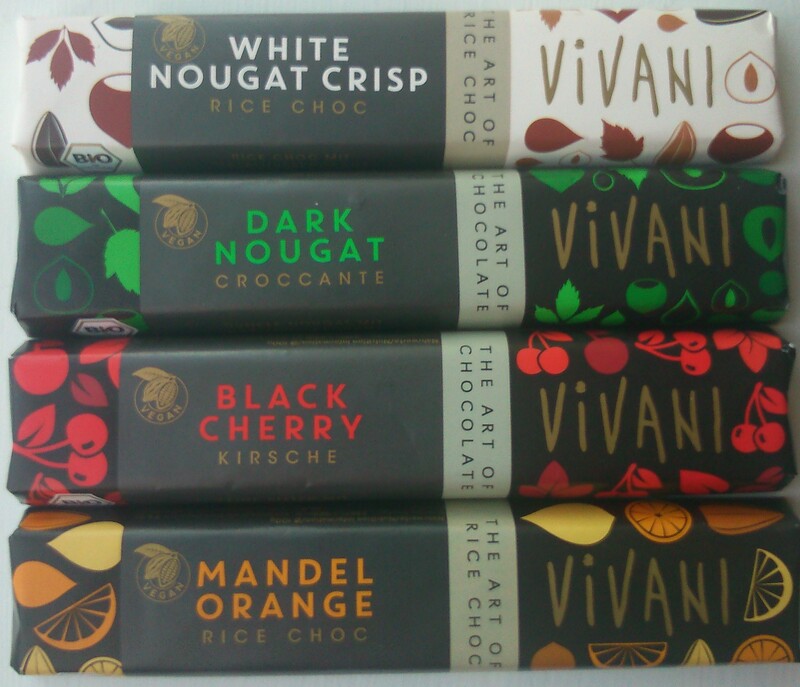 Have you spotted these Vivani bars about? If so- what did you think? Ohh, lovely. and it’s National Chocolate Week! I shared on our page and twitter. Thanks so much for referencing us again.